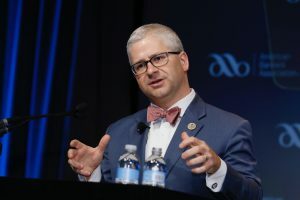 Congress will pass a bank regulatory reform bill this year, Rep. Patrick McHenry (R-N.C.) said today at ABA’s Government Relations Summit. Congress will pass a bank regulatory reform bill this year, Rep. Patrick McHenry (R-N.C.) said today at ABA’s Government Relations Summit. In remarks to reporters after his talk, he said “[w]e’ll get Dodd-Frank reform signed by the president” and that it’s only a question of “one package or two packages and when.” The two-package option would allow the House to pass S. 2155 — the bipartisan regulatory reform bill that includes several previously passed House provisions and that passed the Senate last month — as the American Bankers Association has advocated, and then for members of Congress to advance a second banking bill. 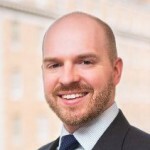 McHenry, who is both chief deputy majority whip in the House and the vice chairman of the House Financial Services Committee, also addressed the constant need for bankers to “embrace the technology that brings you to the future.” He said he was worried that banking is “going through its Kodak moment,” referring to the demise of the once-dominant camera and film company, and he outlined his vision of a regulatory architecture that did more to foster financial innovation.